A neighborhood of freedom, acceptance, creativity and diversity. Our mission is to unite area merchants to promote the Castro's interests, increase opportunities and facilitate communication between businesses and local government. CM 2019 Membership Open Enrollment, JOIN TODAY! Welcome to the official new Twitter of Castro Merchants! Castro Merchants welcome you to our on-line community. I feel honored to live and work in the Castro. I love that while the neighborhood is still vibrant and changing, it remains special, creative, and accepting. What I like about the Castro is that I feel like I am in what exemplifies San Francisco the best. All types of people doing everything you can imagine, there's really nowhere like it anywhere! Dr. Charap opened her office in 1978, watching the many changes of our neighborhood. She loves the spirit that embodies the soul of our community. I love the Castro because it is full of fun and passionate people who enjoy living and working here, like me! Why I love the Castro: "We are the heart of San Francisco! I love that the Castro is a neighborhood everyone loves to celebrate in. From Pride to Halloween and every weekend in between, it's a place of inclusion and happiness. A very friendly and open-minded community that has been at the forefront of Civil rights advancement for decades - what is there not to appreciate about the Castro and it's denizens? I love The Castro's winning combination as an international icon and destination, while preserving its character as one of San Francisco's special neighborhoods where locals and visitors from afar shop, eat, drink and stay. Castro Merchants is made up of merchants based in San Francisco's iconic Castro neighborhood, an international beacon of freedom, acceptance, creativity and diversity. Castro Merchants is proud to count among its founders, Castro's own Harvey Milk, who understood that thriving Castro businesses would help create a strong and powerful community. Our members include a variety of businesses including food and beverage, nightlife/entertainment, retail, salons, spas, healers, professional services and community organizations. All serve local residents as well as the many domestic/international visitors who make Castro a popular tourist destination. Our Mission is to protect, promote, and advocate on behalf of all Castro businesses. Originally known as Eureka Valley, the Castro was once part of a large rancho owned by Jose de Jesus Noe, a Mexican land baron. He began selling it off in 1852, after the American conquest of California. In the 1880s, German, Irish and Scandinavian immigrants began settling Eureka Valley and building handsome Victorian row houses for their big families. The Market Street Cable Railway connected Eureka Valley with the rest of San Francisco in 1887, creating a housing boom and turning the village into a thriving working-class neighborhood. The current F-line Streetcars commenced operation in 1995 and serves as a daily transportation line between Fisherman’s Wharf and The Castro. Having transformed from a working-class neighborhood through the 1960s and 1970s, the Castro remains a symbol and source of lesbian, gay, bisexual, transgender (LGBT) activism and events. The activism of the '60s and '70s forged a community with sizable political and economic power, and when the historic Twin Peaks bar at Market and Castro streets removed the blackout paint from its floor-to-ceiling windows, most took it as a sign that Castro residents were secure in their gay identity. There were, however, tense and sometimes violent clashes with the police, and the assassination in 1978 of openly gay San Francisco Supervisor Harvey Milk was a turning point in the community's history. Milk's assassination and the impact of AIDS brought the community together and made activists of almost everyone; the Castro became not just open but celebratory about its thriving gay and lesbian population. Please fill in form below to add your event to the Castro Merchants' News and Events Calendar. 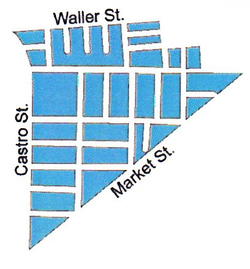 The Castro/Eureka Valley Neighborhood Association (EVNA)provides a public forum for the people who live, work, and play in the greater Eureka Valley area to discuss common issues and concerns, and help develop solutions to improve the neighborhood. The San Francisco Municipal Transportation Agency (SFMTA) oversees transit, streets and taxis in the city of San Francisco, California. Castro/Upper Market Community Benefit District (CBD) is run by an appointed Executive Director and an elected Board of Directors consisting of residents, community activists, business representatives, and property owners, meets monthly to respond to neighborhood issues such as street safety and cleanliness, and to directly influence land use, economic development, and future planning in their area. Hoodline is a neighborhood news network covering San Francisco. Well, part of San Francisco. But we're growing. Hoodline has its origins in three local San Francisco blogs -- Haighteration, Hayeswire, and Uppercasing. Those blogs joined forces in 2014, switched from Wordpress to Rails, and brought on some new talent to form what is now Hoodline. to recruit and connect with clients, donors &/or volunteers. The Office of Economic and Workforce Development (OEWD) supports San Francisco's ongoing economic vitality by strengthening its neighborhoods, businesses, commercial corridors and workforce. The San Francisco Small Business Development Center (SBDC) helps individuals start, manage and grow their businesses.We provide free, confidential one-on-one customized consulting services and training workshops in English, Spanish, Mandarin and Cantonese to established businesses and certain start-ups in San Francisco. San Francisco Public Works (SFDPW) is a world-class public works organization that contributes to making San Francisco a beautiful, livable, vibrant, safe and sustainable city. We enhance the quality of life in San Francisco by providing outstanding public service. Directed by the Small Business Commission, the Office of Small Business (OSB) and its Small Business Assistance Center (SBAC) function as the City's central point of information and referral for entrepreneurs and small businesses located in the City and County of San Francisco. Bay Area Reporter (BAR) is the nation's oldest and highest circulation LGBT news weekly serving San Francisco's lesbian, gay, bisexual and transgender communities. Founded in 1971, B.A.R. is regarded for its original writing covering news and entertainment relevant to our lives. B.A.R. is published every Thursday by BAR Media Inc., and is distributed in San Francisco and surrounding cities of the Bay Area. The S.F. Planning Department in collaboration with the Municipal Transportation Agency and the Department of Public Works are leading this effort. The project area includes the length of Castro Street from Market to the south side of 19th Street.